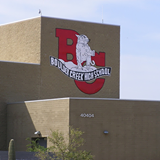 Boulder Creek High School, Arizona - Áine Mulvey, M. Mus. Guest Lecture Presentation on the Irish Uprising event with musical selections. As part of the outreach activities of their “Songs of Ireland” US tour, Áine Mulvey (mezzo-soprano) and Anne-Marie O’Farrell (harp) will present a concert of Irish music associated with the 1916 Rising to the students of Boulder Creek High School, in Anthem, Arizona.